If you took full advantage of De La Soul's recent self-bootlegging exploits then, like me, you've found yourself in possession of a virtual cache of digital goodies, including the ad scan to the left. You even got a folder full of lesser-known audio, including the Clear Lake Audiotorium EP and and the 3 Feet High and Rising Bonus Disc. Comprehensive as this leak may be, it still doesn't account for every piece in De La Soul's recorded history. For a wider purview of all things De La, we turn to The T.R.O.Y. Blog, where in 2009, poster Roy Johnson compiled and posted several incredible volumes of rare releases from three different eras, the first being the 3 Feet High & Rising Era (1988-1990). For this period, we get two fully packed volumes. In Roy's own words, "I attempted to create to create an alternate version of the officially released album on volume 1, with volume 2 containing all the leftovers." To salute a job well done and continue spreading the gospel of De La, I've re-upped the 3 Feet High & Rising Era Rarities volumes 1 and 2 via mediafire. 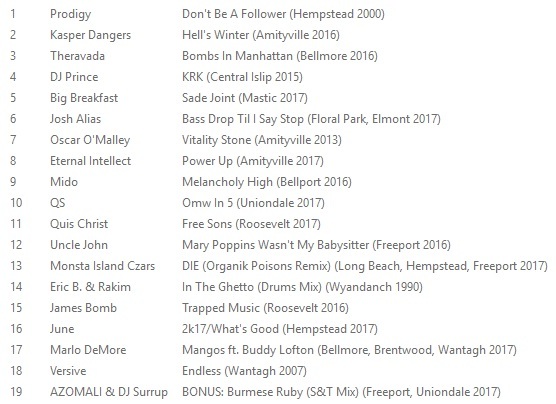 Nab those now before the links die again, and below, preview a few songs you couldn't get on the Bonus Disc.